Something that helps me appreciate my many blessings is focusing on the things I have, rather than the things I’ve lost. Something else which helps is thinking about– and doing things for– people who are in need. And it’s more fun when you invite your friends to this, too. Last year I invited the Zenspirations® Community to join me in raising awareness of worthy causes to support on Giving Tuesday, and I was delighted at the response! I love the thought of ‘Zenspired Giving’ where our community shines a light on causes we care about, and inspires others to make a difference in the world by giving! If there is an organization you believe in– especially one that you support through the gift of your time, talents, financial and material donations– you can help them reach their fund-raising goals by promoting them on #GivingTuesday. In case you aren’t familiar with Giving Tuesday, it’s a global day of giving fueled by the power of social media and collaboration, which is celebrated on the Tuesday following Thanksgiving (in the U.S.). It kicks off the charitable season, when many focus on their holiday and end-of-year giving. Last year, during the sixth annual Giving Tuesday, an estimated $274 million was raised online in the United States. Facebook and the Bill Gates Foundation both gave matching grants. 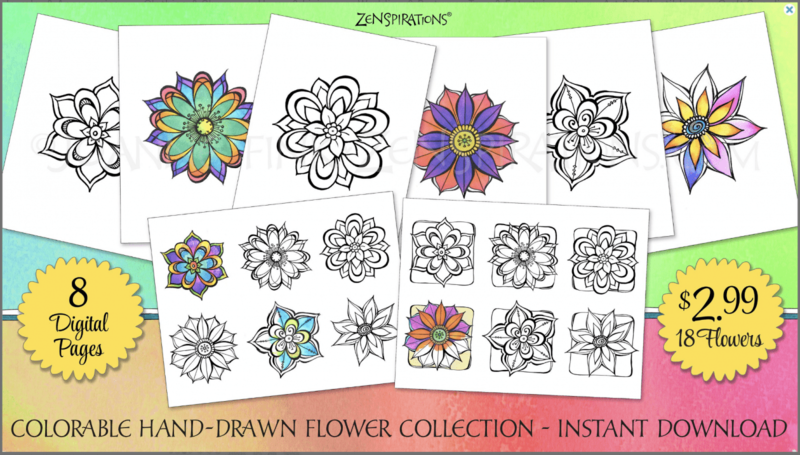 Members of the Zenspirations® community not only donated, but many members shared their favorite charities. I’m inviting you to do it again! Promote your favorite charitable cause on Facebook, Pinterest, Instagram, Twitter, LinkedIn, SnapChat and other Social Media using the hashtags #GivingTuesday and #ZenspiredGiving. On Facebook you can help your favorite non-profit by creating a Fundraiser, writing a Post or going Live. Visit Facebook.com/fundraisers, click “Raise Money” and select from 750,000 nonprofits for your fundraiser. Post: Write a post and tag your favorite nonprofit. You’ll be able to add a donate button after you post. Live: Tap “Live” at the top of your News Feed and click “Add Donate Button” from the menu. Tell us about the organizations you support and why you would like the Zenspirations® community to consider supporting them, too. I invite you to share information about your favorite worthwhile cause in the comment section. Last year I spent most of the Thanksgiving holiday vetting each recommended organization on charitynavigator.org or charitywatch.org, and compiled a list of our community’s favorite charities: Zenspirations®_2017_Giving_Tuesday _Recommended_Charities. Please take a look at the list, and also check out last year’s blog post, Help Make a Difference Today, which highlights some of the causes which touched my heart. Another way I stay grounded in gratitude is by keeping a gratitude list, and actually writing down what I am most grateful for that day. At this time of year, I am especially grateful for the opportunity to spend time with family and friends– and for the meaningful connection I have forged with members of the Zenspirations® community. I feel incredibly blessed to be part of this creative, caring and compassionate community, and am continually inspired by the creative work shared in our Facebook Group. I want to wish all my American friends a very happy Thanksgiving holiday, and I have a Thanksgiving gift for everyone– no matter where in the world you live! Everything in my Etsy Shop is on sale for 50% off from now until midnight on cyber-Monday! In addition to the sale, every order will include a surprise bonus gift. Everything in the shop is an instant digital download. 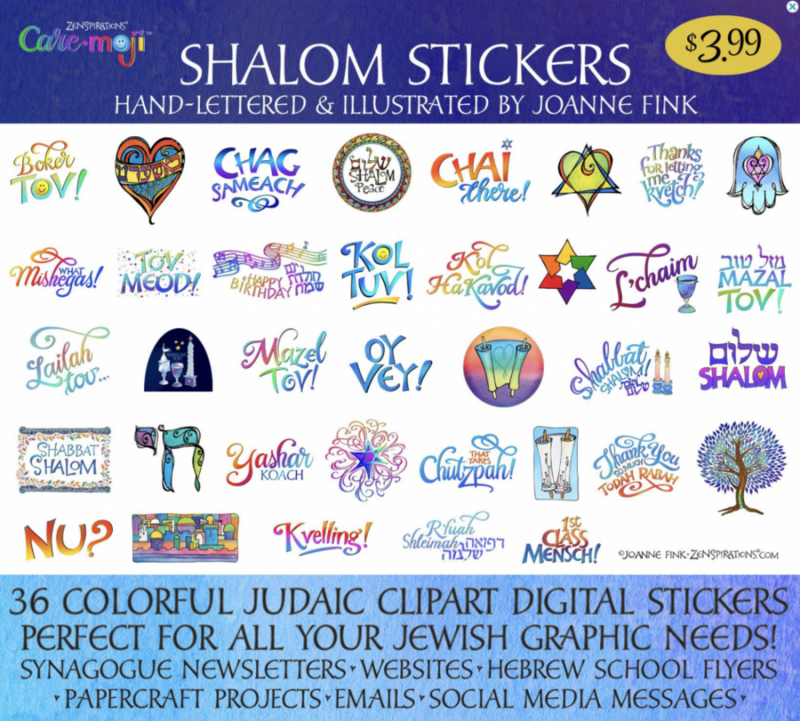 Here’s a sneak peek at the two newest items: Shalom Stickers (on sale for $1.99!) and Message Mojis (on sale for $1.49!). Both of these collections are clipart versions of the Care-Moji Textable Sticker App Collections. The Message Mojis App for iPhones & iPads just launched this week. It’s available in the App Store for $1.99. 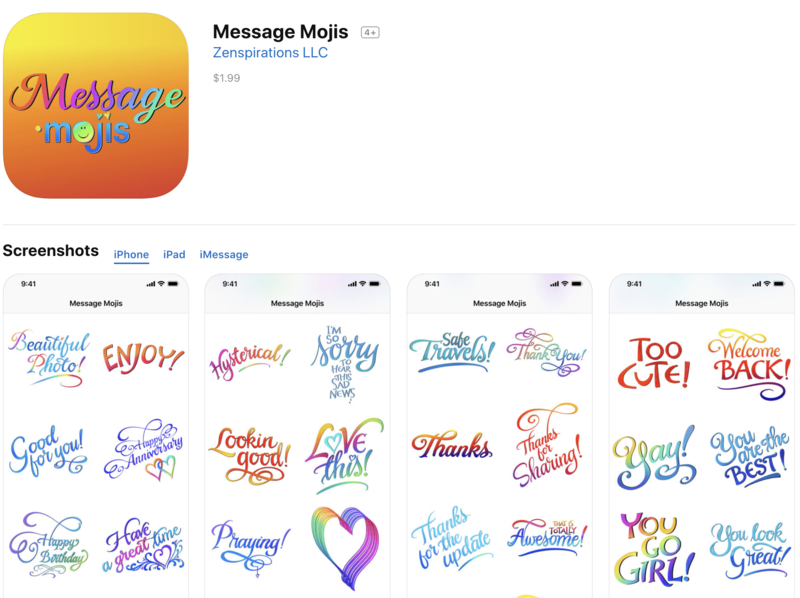 Message Mojis are different than the first few Care-Moji collections, because in addition to being able to text them, you can also share them via e-mail, iMessage, and social media. I called this collection “Message Mojis” because they are the messages I like to leave on my friends’ Facebook posts. 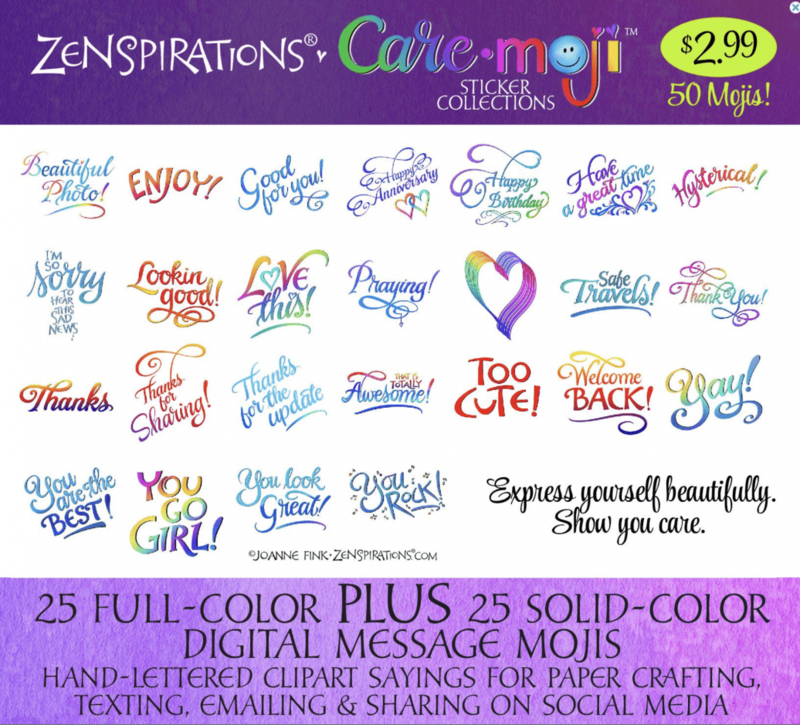 If you are a Care-Moji fan, please let me know which of the collections you’d like to use as clipart, and I’ll work on adding them to the ZenspirationsDesigns Etsy Shop. The Cyber-Sale include ALL 43 items in the Shop. The Perpetual Calendar, which is a 15 page download, is on sale for $2.49! The first collection I posted, the Dangle Monogram Alphabet is only $12.95! The flowers– which is an eight page collection– is on sale for $1.49! If you decide to buy something– now or in the future– I’d be grateful if you would take a few minutes to leave a review. Just like on Amazon the more five star reviews you have, the better! 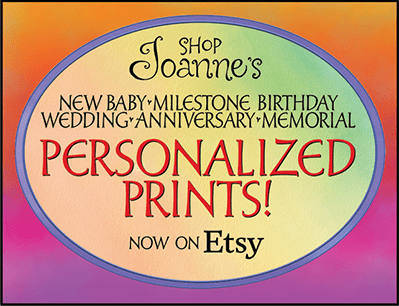 I’d also be grateful if you would let your fellow color and creativity enthusiasts know about my new shop. In a season of making a difference, that would make a big difference to me! Please consider helping me support a cause near and dear to my heart. As you know advocacy for Traumatic Brain Injuries is a year round effort for myself and others who are affected by this often invisible disability. My good friend Amy Zellmer has started a year long campaign, where she will photograph survivors across the country to show that this invisible injury affects all ages, race, gender, and income levels. It does not discriminate, and it isn’t always visible. #NotInvisible will help support the growth of Love Your Brain Foundation Retreats! Every $1 raised helps a brain injury survivor attend one of the wellness retreats!! #LoveYourBrain (LYB) is a non-profit that improves the quality of life of people affected by traumatic brain injury (TBI) and raises awareness about the importance of brain health. This year I am supporting two non-profits that advocate for realistic and reasonable gun control laws. The aim, of course, is to curtail gun violence in this country. The Sandyhook Promise and Everytown for Gun Safety are the two organizations that will have my backing this Giving Tuesday.